DKN Series forced convection ovens have high level of air circulation, accuracy and uniformity. Ergonomically designed, SM Series sterilizers are vertical, compact and space saving. Low temperature incubators, IN Series with option for observation window and internal shaker power connector. Built with a robust frame, RE Series rotary evaporators are incredibly reliable, highly functional and extremely durable. Compact and economical ADL spray dryer can be connected to GAS410 to create an inert sealed circulation system. Spray drying technique is a method of feeding liquid materials through a nozzle in contact with heated air, resulting in dry powder. It is an ideal process where the end product must comply to precise quality standards regarding particle size distribution, residual moisture content, bulk density and particle shape. The area where spray dryer is used is widespread — Pharmaceuticals, Food, Dairy & Beverage, Agriculture, Chemical, Biochemical, Polymer, Ceramic, Material Research, Cosmetics & Fragrances as well as other application areas and industries. For over 40 years, Yamato Scientific has built on its expertise in spray dryers resulting to excellent performance spray drying systems. Yamato Spray Dryer has become increasingly popular because of its easy installation, operation, handling and spray drying effectiveness. ADL, GB and DL models efficiently and reliably dry and transform liquid solution, suspension, or emulsion into a uniform, fine amorphous powder. They do not require liquid sample or solution to undergo any pre or post-processes such as filtration, separation or pulverization unlike vacuum drying and freeze drying. 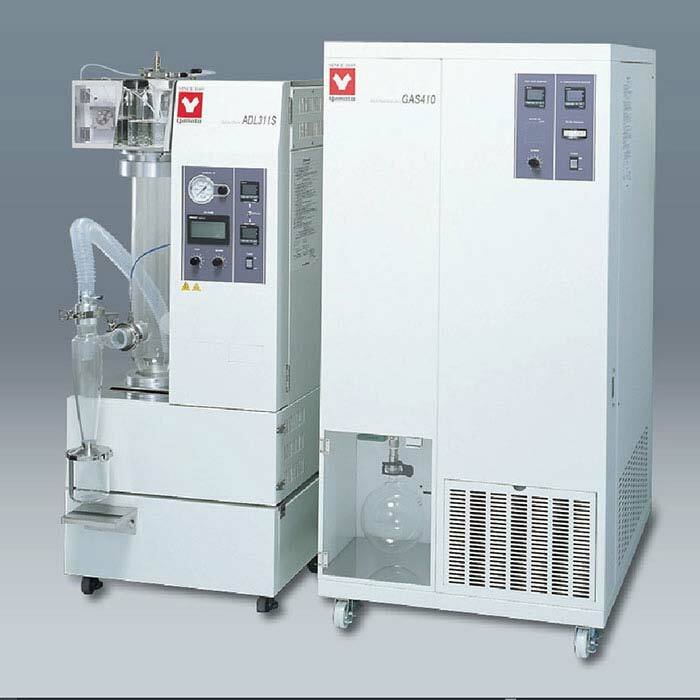 ADL311SA is Yamato’s compact and economical spray dryer model for aqueous soluble samples. It is highly mobile on wheels or stationary as a bench top unit. When organic solvents are used, a GAS410 Organic Solvent Recovery unit is required. Check out our inventory of never been used products offered at attractive prices within your budget!